NO SET-UP CHARGES! 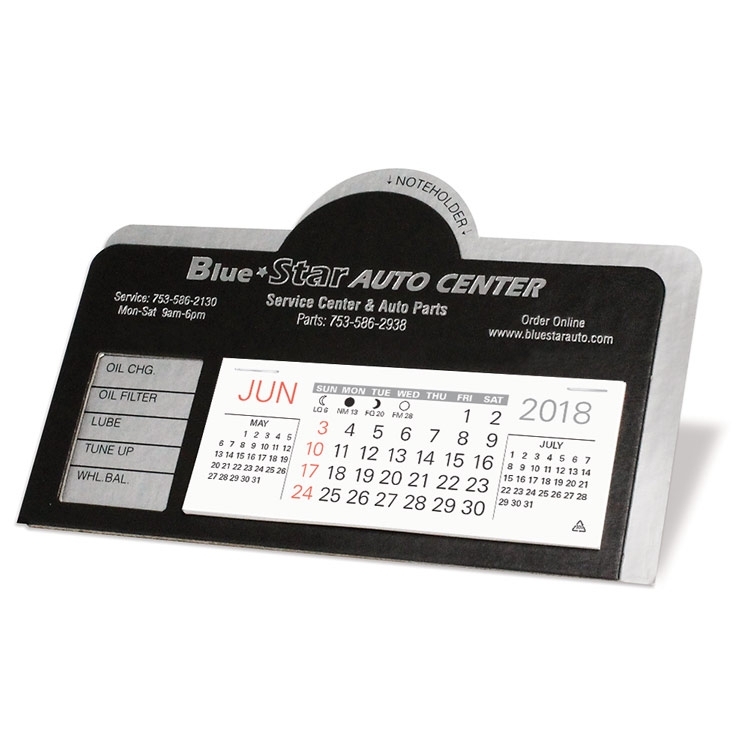 The Vigilant Desk Calendar features the large 6 1/2" x 4 3/16" 13 month memo style date pad. Available in White with red or blue trim with matching color imprint or white with black imprint. See "Options" for other than standard color imprint. Free mailing envelopes are included, calendars not inserted. 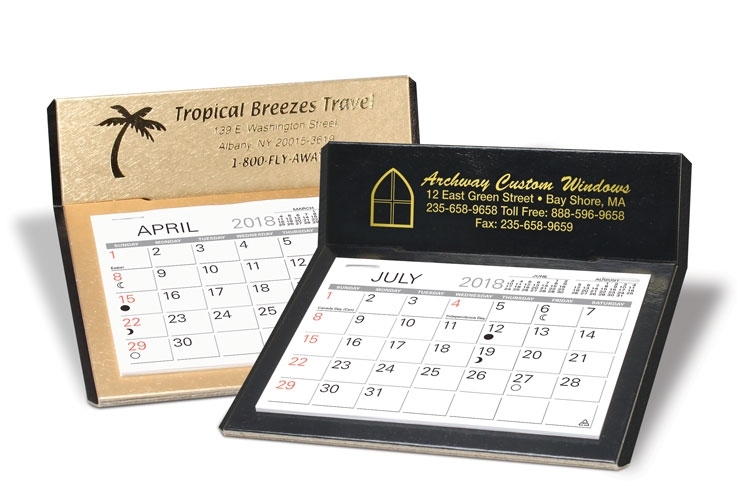 Colonial style desk calendar, with 3 month at-a-glance pad. Shown with 2 color imprint. 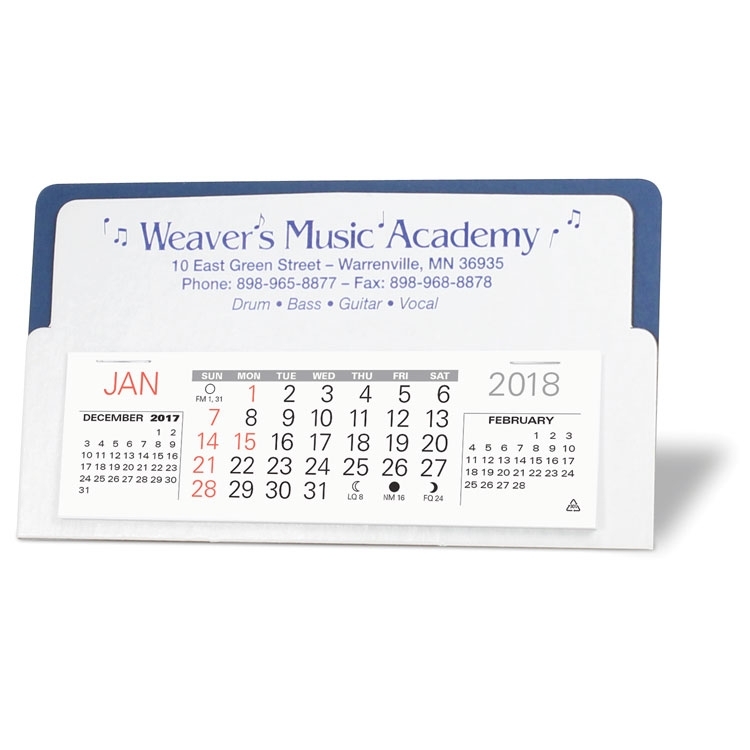 Calendars are prepackaged and inserted into a mailing envelope. NO SET-UP CHARGES! 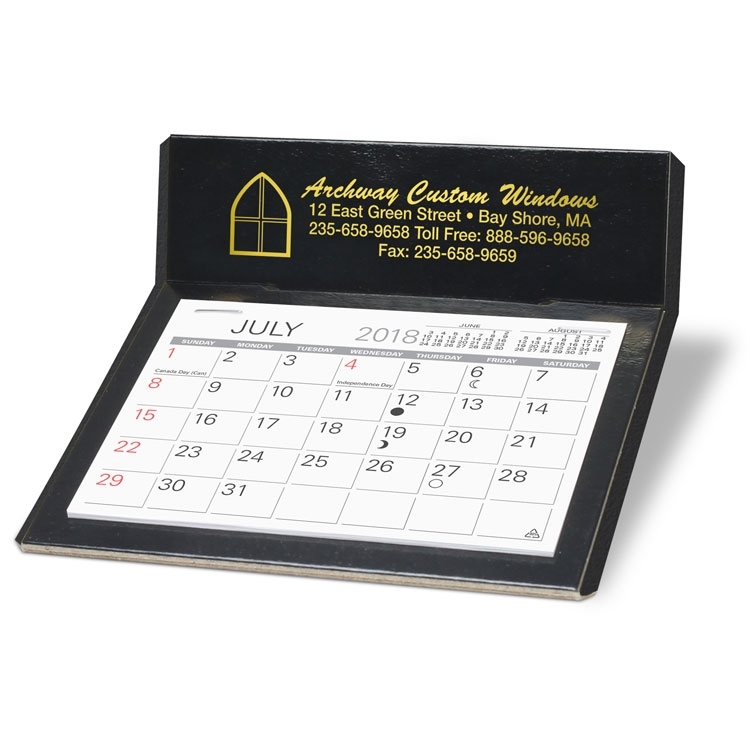 The Discreet Desk Calendar features an ink imprint and the 5 1/4" x 1 5/8" 3-month-in-view 13 month style date pad. Available in white with red trim and red imprint or blue trim with blue imprint. See "Options" for other than standard color imprint. Free mailing envelopes are included, calendars not inserted. NO SET-UP CHARGES! 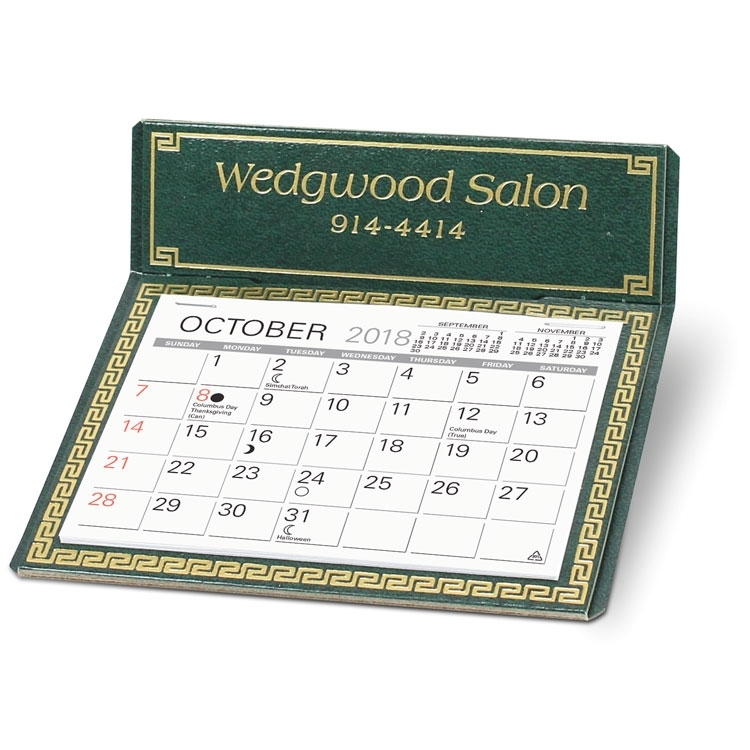 The Dominique Desk Calendar offers a foil stamped imprint, a 4 3/8” x 3 1/4” memo style 13 month date and a gold foil stamped trim. Standard in white, woodgrain or black all with a gold imprint. See "Options" for other than standard imprint colors. Free mailing envelopes are included, not inserted. NO SET-UP CHARGES! 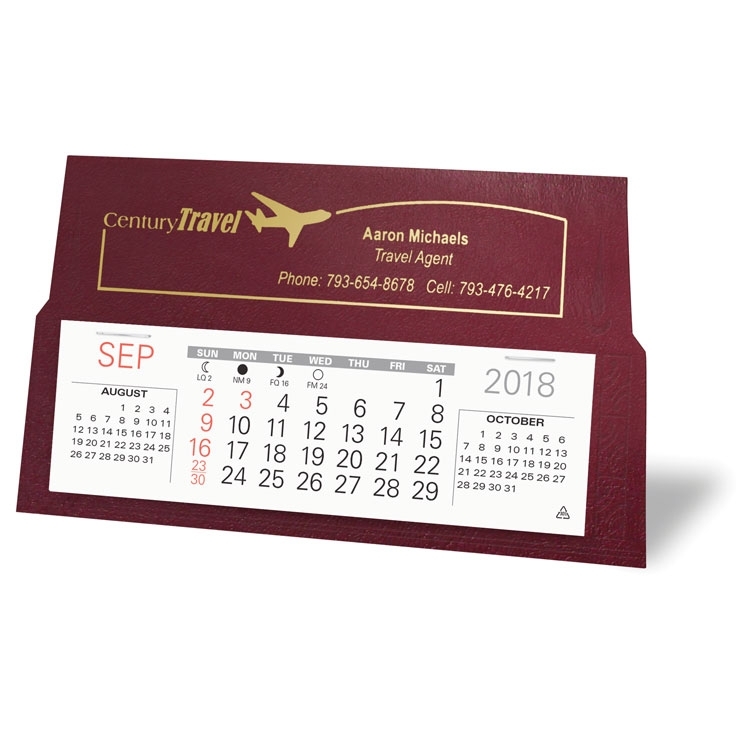 The Ace Desk Calendar offers a foil-stamped imprint is lightweight and easily mailed. 5 1/4" x 1 5/8" 3 month-in-view 13 month date pad. See “Options” for available calendar colors and imprinting the envelopes. Free mailing envelopes are included, calendars not inserted. 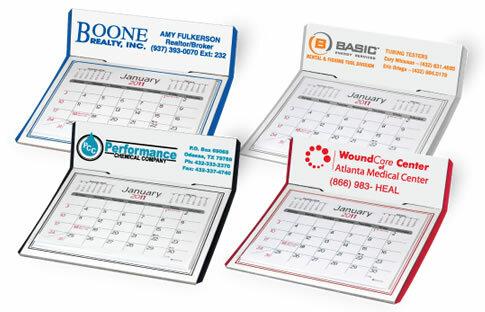 FULL 4-COLOR DIGITAL PRINTED DESK CALENDARS! 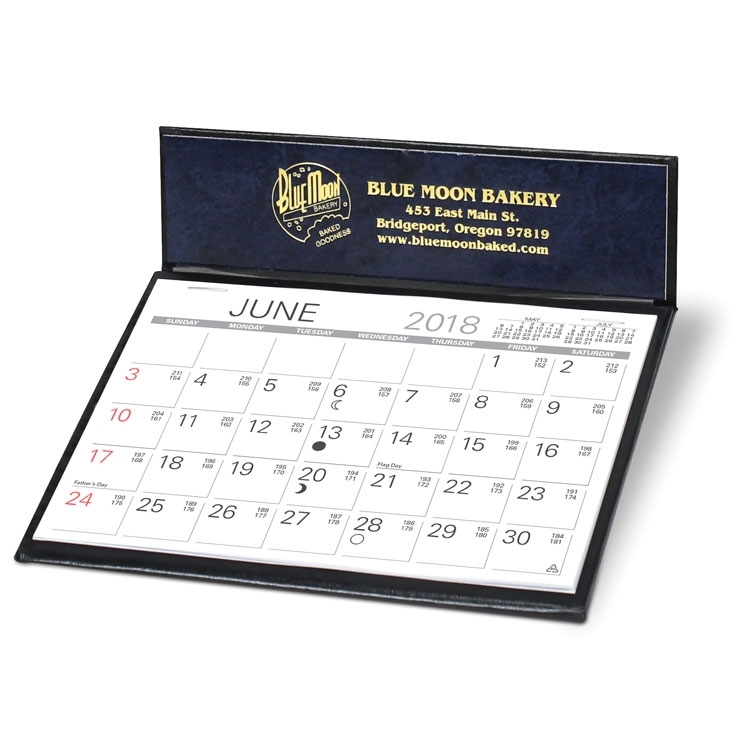 Always popular monthly desk calendars now with a full color imprint at no extra charge! Black over Black Mailing envelopes are included. Not inserted. NO SET-UP CHARGES! 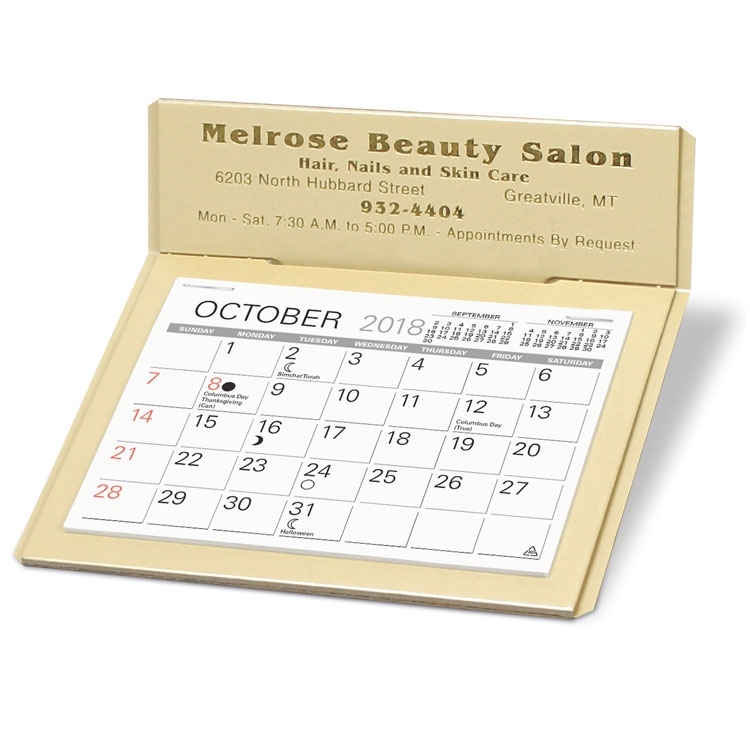 The Prudent Desk Calendar features the 4 3/8" x 3 1/4" 13 month memo style date pad and flip-out name address section. Available in White with red or blue trim with matching color imprint or white with black imprint. See "Options" for other than standard color imprint. Free mailing envelopes are included, calendars not inserted. NO SET-UP CHARGES! 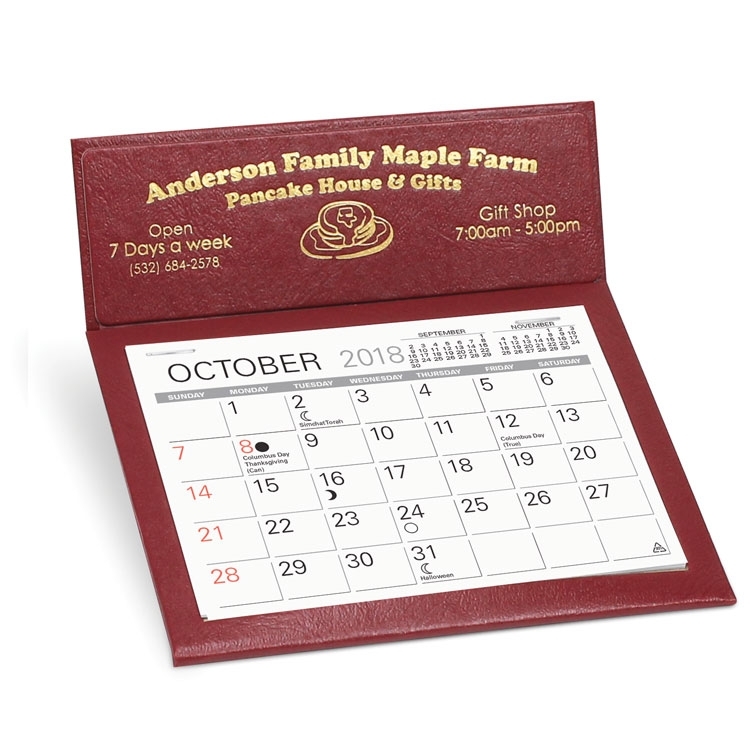 The Naples Desk Calendar is foil-stamped with rich book-bound style edges a flip out phone address directory and a 4 3/8" x 3 1/4" Memo, style 13 month date pad. Standard is a white panel with gold imprint and white, green, red or blue trim. See “Options” for other than stamdard imprint colors and imprinting the envelopes. Free envelopes are included, calendars not inserted. NO SET-UP CHARGES! 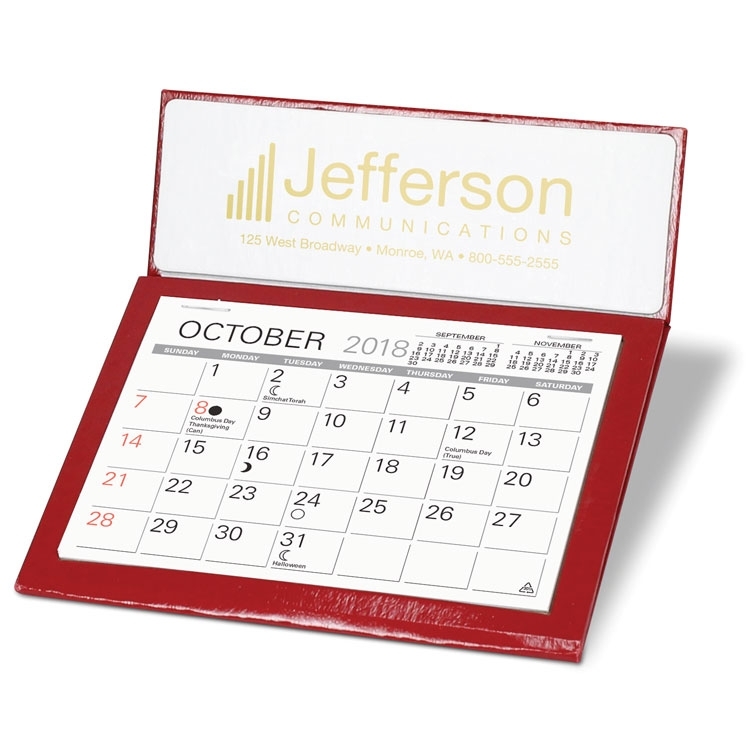 The Personalizer Desk Calendar offers a window to insert your own business card, a foil-stamped imprint and a big 6” x 4 3/16” memo style 13 month date pad. Great for your sales force, branch offices, distributors and more. Standard in white or woodgrain with gold trim, both with gold imprint. See "Options" for other than standard imprint colors. Free mailing envelopes are included, not inserted. NO SET-UP CHARGES! 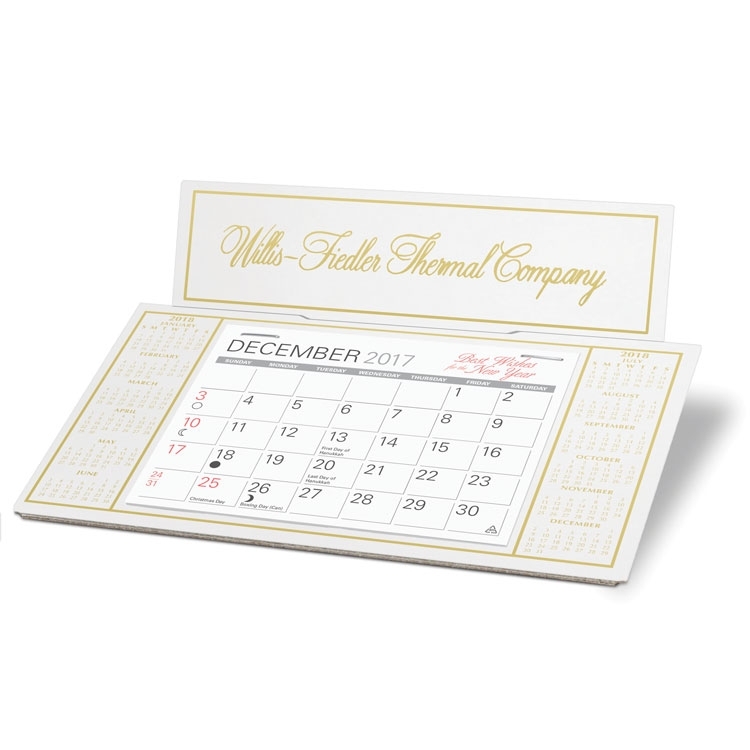 The Imperial Desk Calendar offers a foil stamped imprint and a 4 3/8” x 3 1/4” memo style 13 month date. Standard in white, red w/black trim, woodgrain w/gold trim, black w/gold trim, maroon w/gold trim, navy w/gold trim, turquoise w/white trim or brown leatherette all with a gold imprint. See "Options" for other than standard imprint colors. Free mailing envelopes are included, not inserted. NO SET-UP CHARGES! 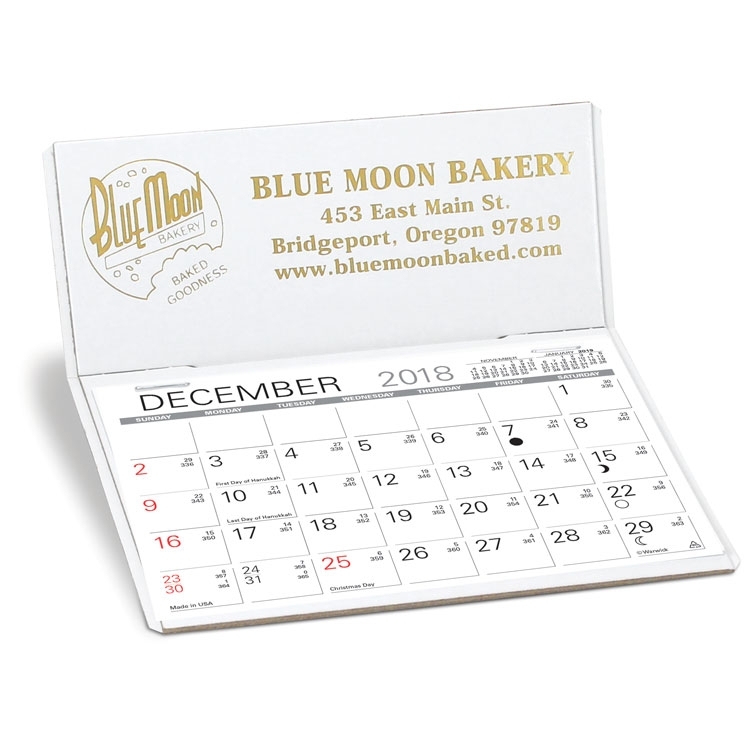 The Economizer Desk Calendar offers a foil-stamped imprint and since it weighs only about 3/4 oz., it's lightweight enough to be easily mailed with little or no additional postage. 5 1/4" x 1 5/8" 3 month-in-view 13 month date pad. 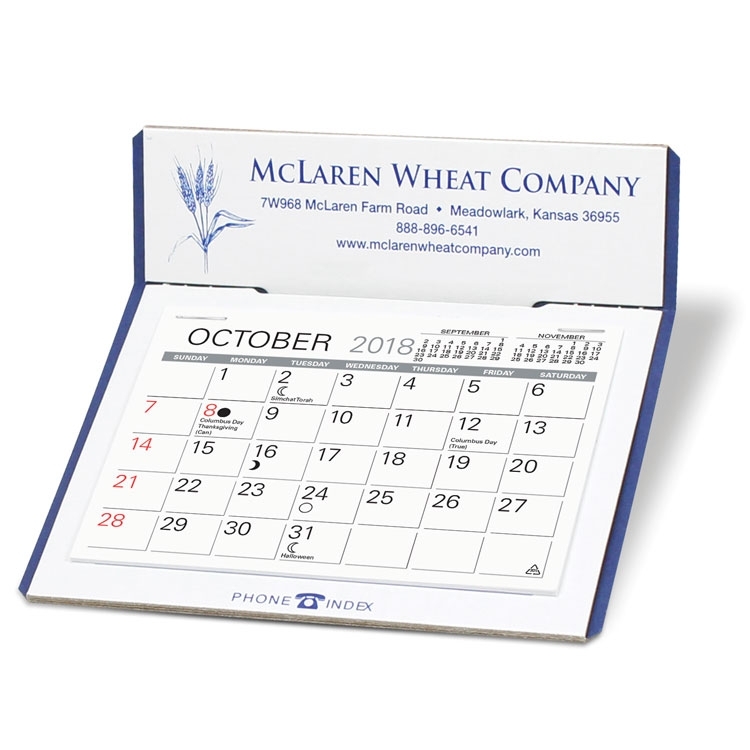 See “Options” for available calendar colors and imprinting the envelopes. Free mailing envelopes are included, calendars not inserted. NO SET-UP CHARGES! 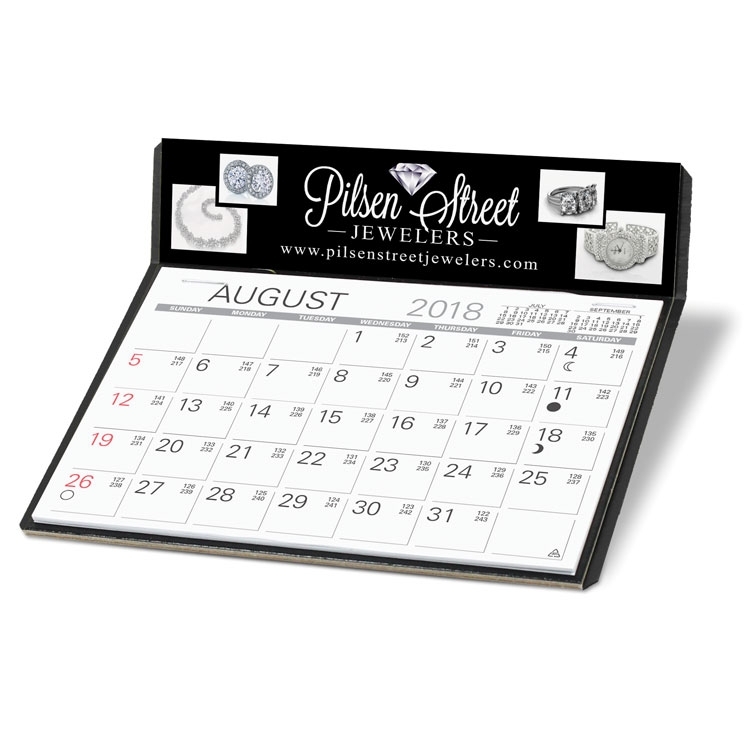 The Princeton Desk Calendar offers a foil stamped imprint, a 4 3/8” x 3 1/4” memo style 13 month date and an attractive gold foil stamped border. Standard in white, wine or green all with a gold imprint. See "Options" for other than standard imprint colors. Free mailing envelopes are included, not inserted. NO SET-UP CHARGES! 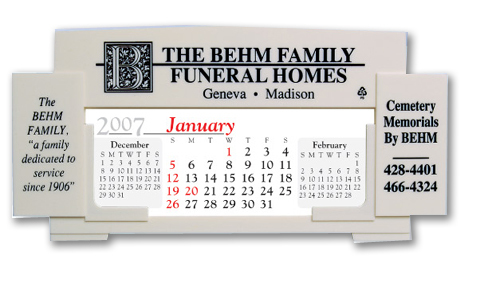 The Citation Desk Calendar is foil-stamped with rich book-bound style edges and a flip out phone address directory. 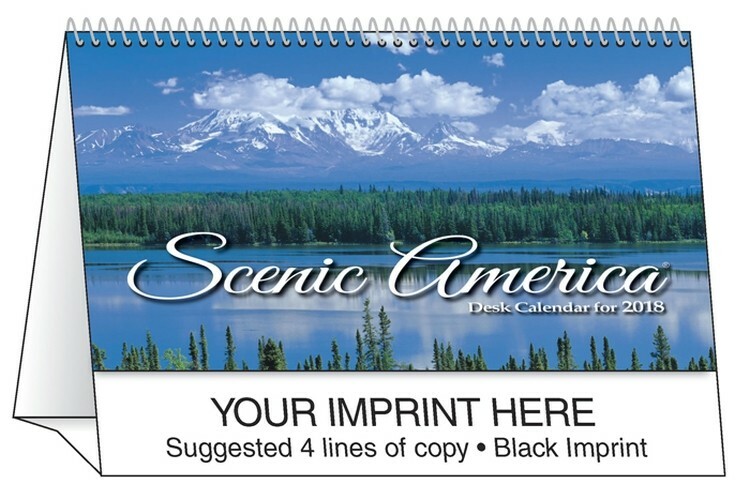 Your choice of a 4 3/8" x 3 1/4" Memo, Scenic or Historical style 13 month date pad. See “Options” for available calendar colors and imprinting the envelopes. Free envelopes are included, calendars not inserted. NO SET-UP CHARGES! Attractive foil-stamped two-tone design with flip out phone index. 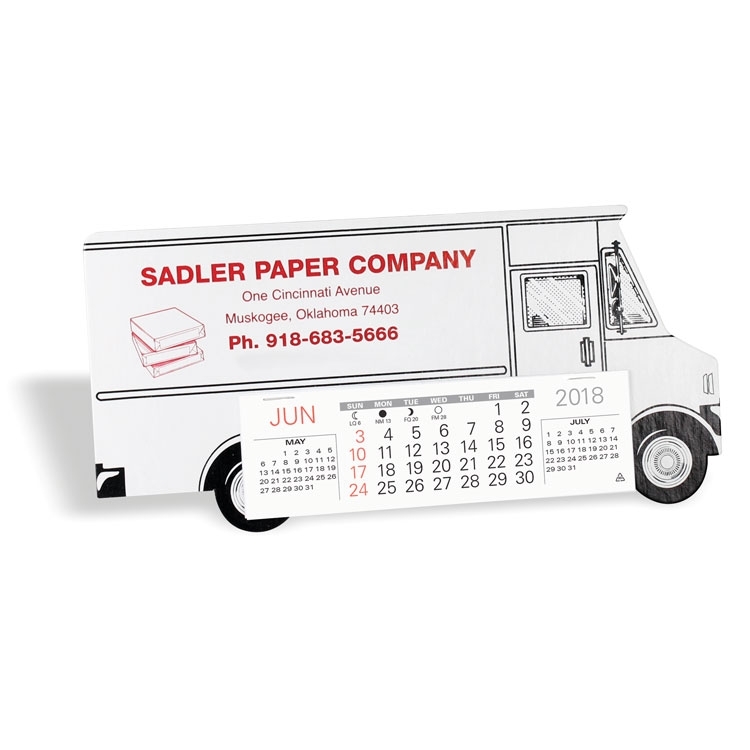 Large 6" x 4 3/16" memo style 13 month date-pad. See "Options" for available colors, standard imprint colors and other than standard imprint colors. Free mailing envelopes are included, not inserted. 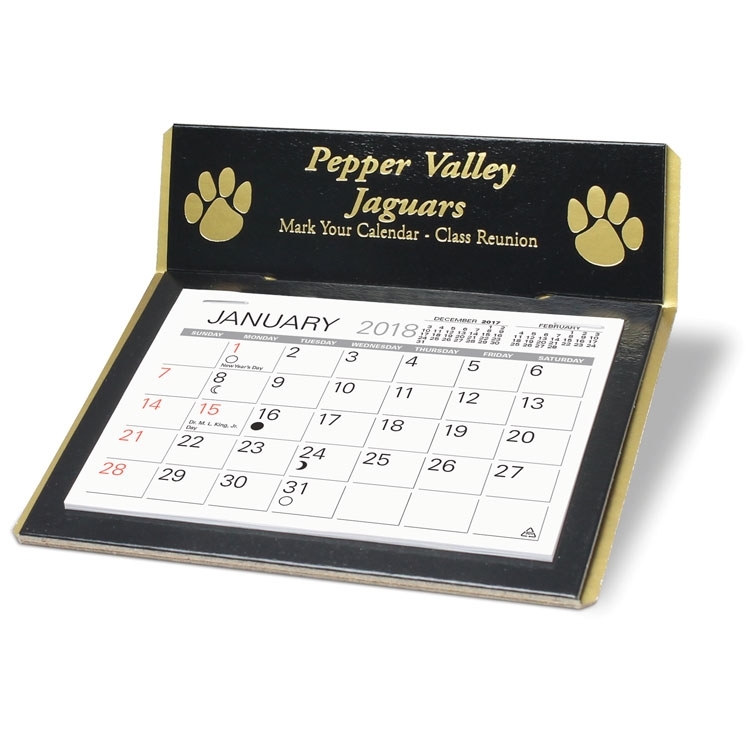 CustomLine VI custom full-color desk tent calendar with easel stand. Black imprint and spiral binding included. White envelopes included. 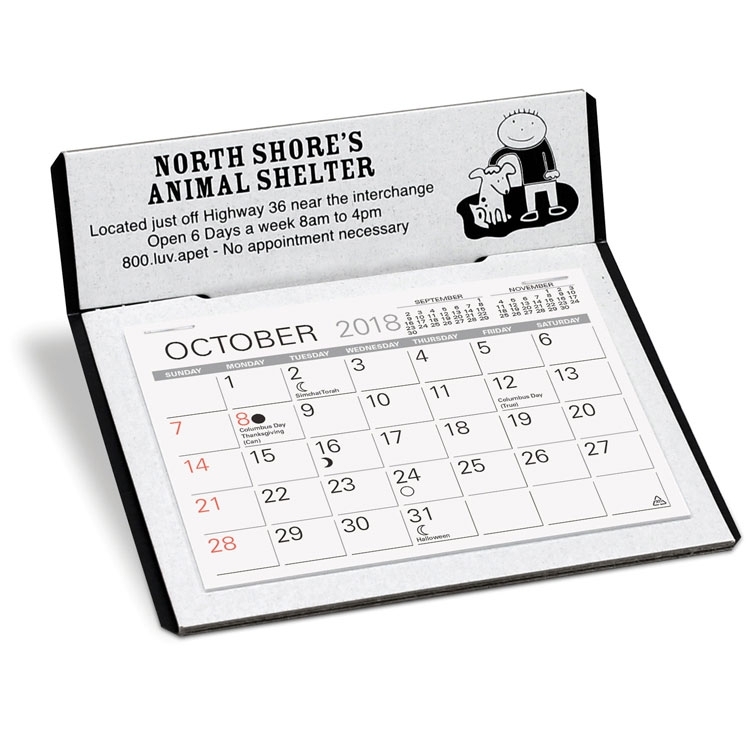 Calendar size: 6 1/4" x 4 1/2": image area cover: 6 1/2" x 3 1/2"; thirteen months: 3 1/4" x 3 1/2". 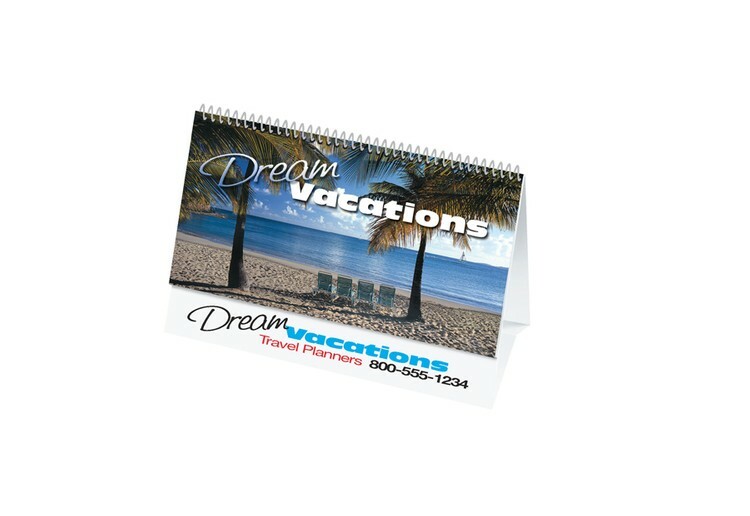 Create your own colorful desk tent calendar with custom cover and 13 month pad. 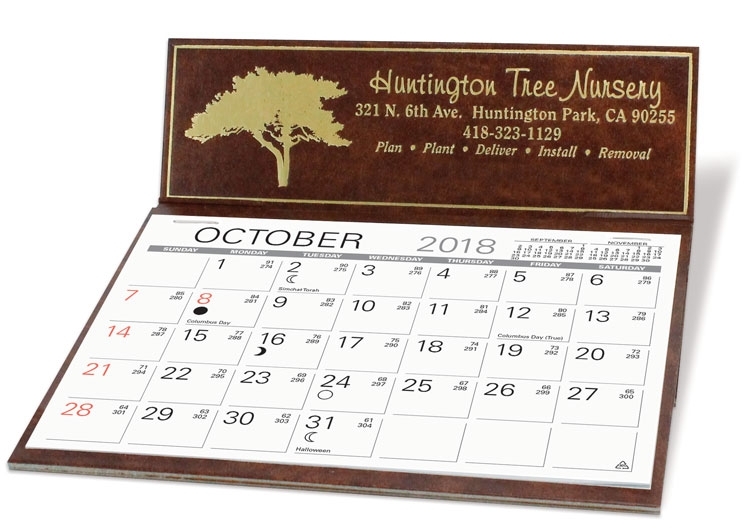 The one-piece easel stand is imprinted on both sides and the calendar ships flat for easy mailing. 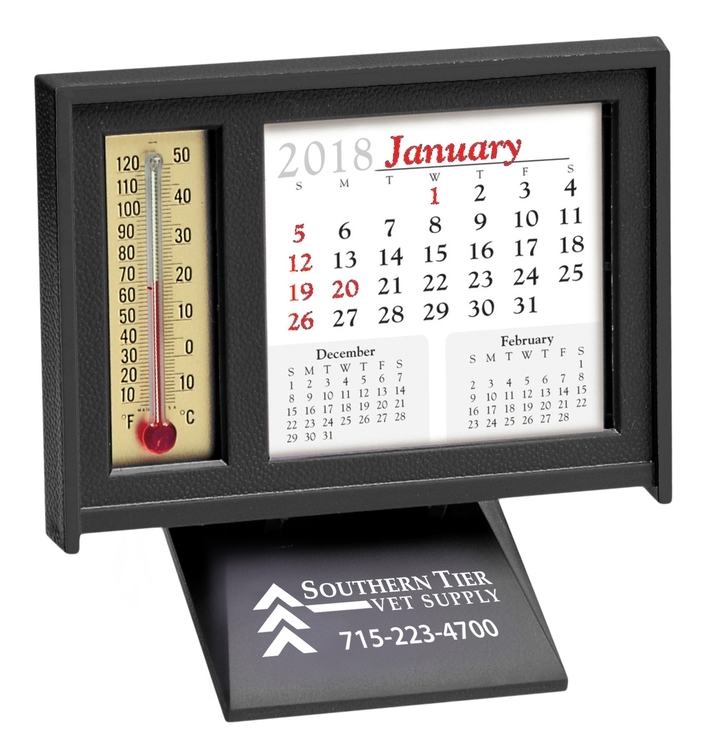 Thermometer & desk calendar. Black or Brown stock shown with 1 color imprint. NO SET-UP CHARGES! 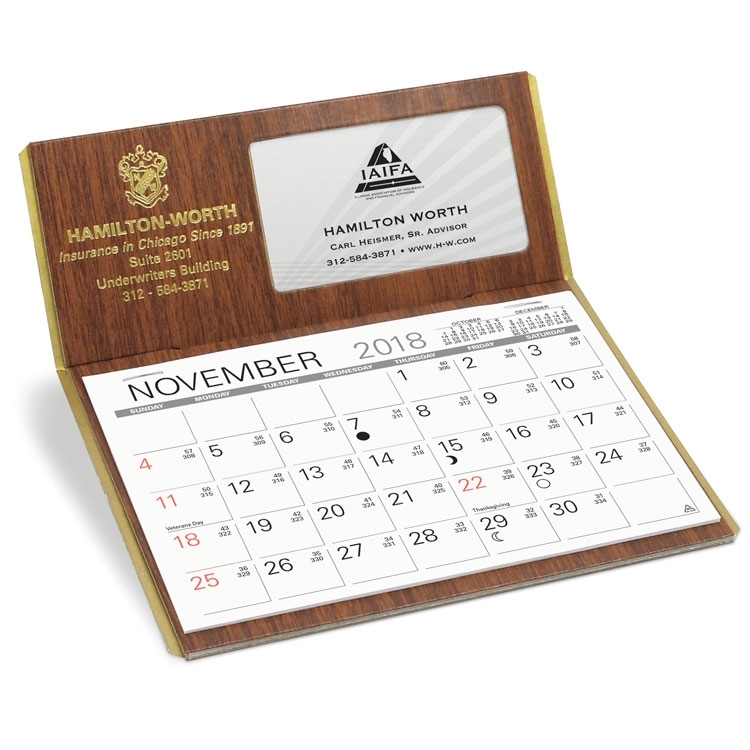 The Crest Desk Calendar is foil-stamped with 4 3/8" x 3 1/4" 13 month memo style date pad. Available in gold with black trim or all black with gold or black foil-stamped imprint. Free mailing envelopes are included, calendars not inserted. NO SET-UP CHARGES! 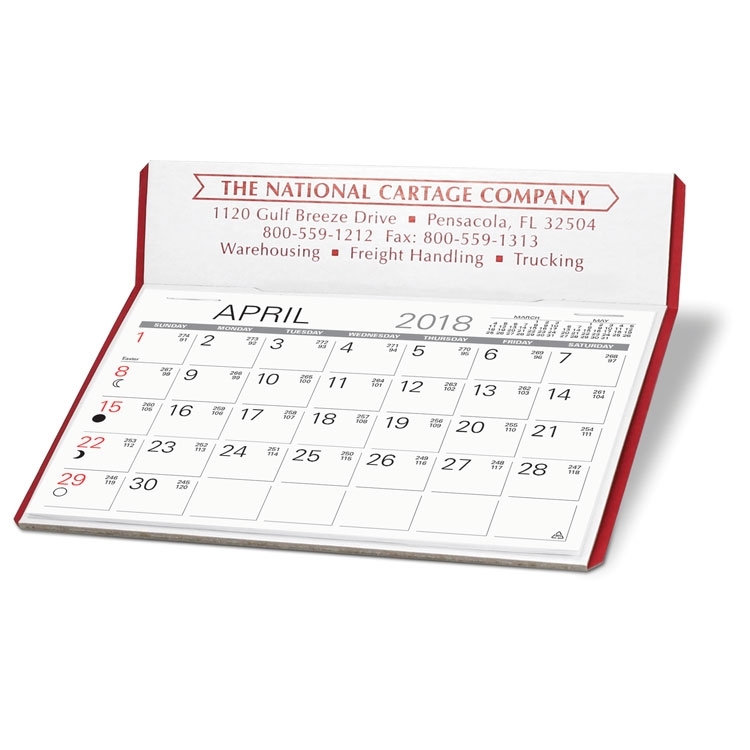 The Natural Desk Calendar is ink printed and crafted entirely from recycled paper. 4 3/8" x 3 1/4" Memo style 13 month date pad. See options for available colors. Free envelopes are included, calendars not inserted. NO SET-UP CHARGES! 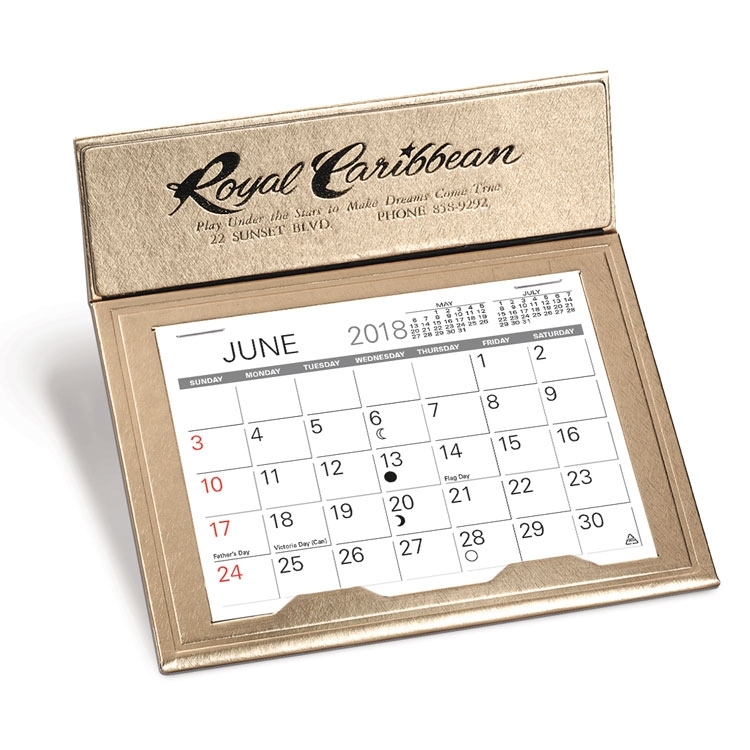 The Crown Desk Calendar is foil-stamped with a 4 3/8" x 3 1/4" 13 month Memo style date pad and a handy flipo out phone address section. Available in gold or black with gold or black foil-stamped imprint see "Options" for other than standdard color imprint. Free mailing envelopes are included, calendars not inserted. NO SET-UP CHARGES! 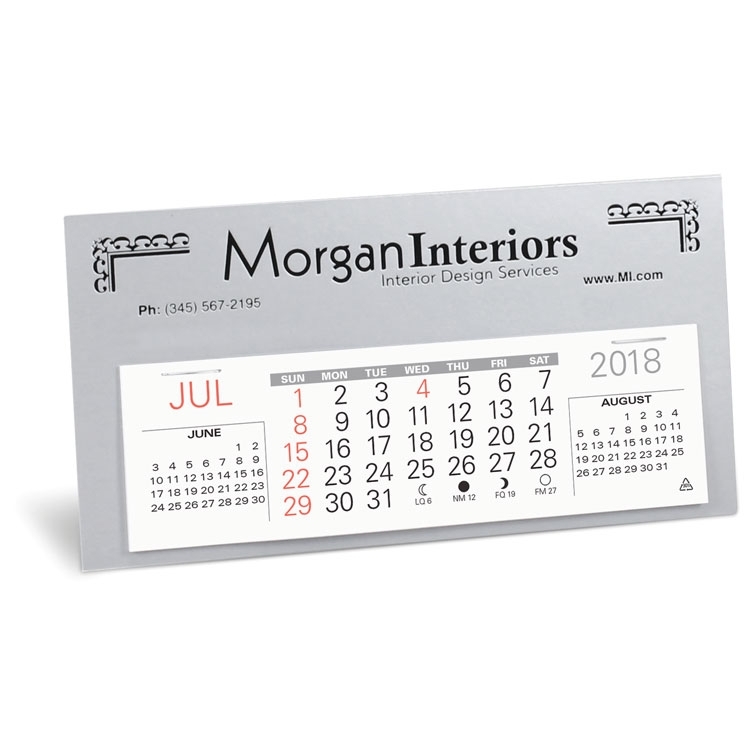 The Marquis Desk Calendar features a gold foil-stamped imprint with a gold stamped border and the large 6" x 4 3/8" 13 month Memo style date pad and fip-out name/address section. Available Leatherette with gold foil-stamped imprint. See "Options" for other than standard color imprint. Free mailing envelopes are included, calendars not inserted. NO SET-UP CHARGES! 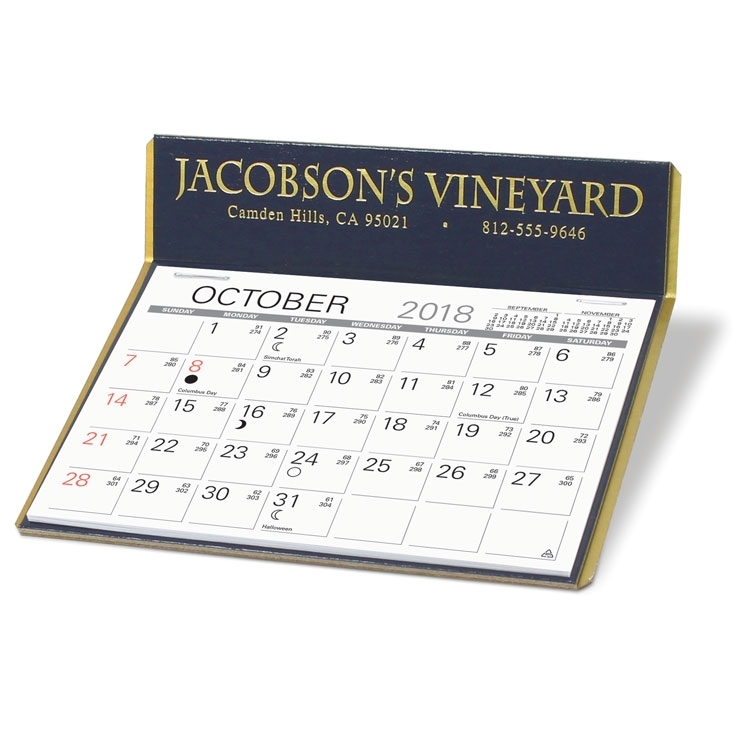 The Versailles Desk Calendar offers a foil-stamped imprint and a 4 3/8” x 3 1/4” memo style 13 month date. Standard in champagne with gold imprint, white pearl with blue imprint or sky blue with white imprint. See "Options" for other than standard imprint colors. Free mailing envelopes are included, not inserted. NO SET-UP CHARGES! 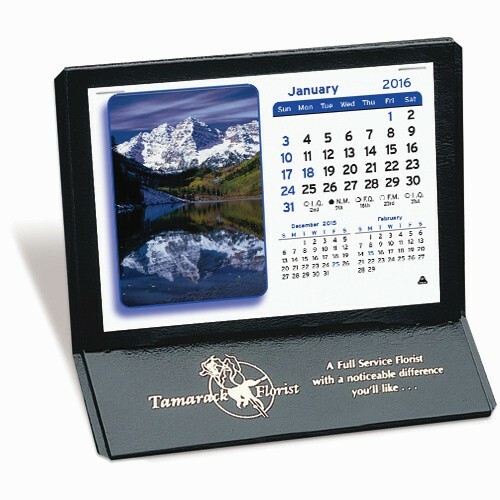 The Charter Desk Calendar offers a foil stamped imprint, a 6” x 4 3/16” large memo style 13 month date. Standard in white w/white trim, red w/black trim, woodgrain w/gold trim, black w/gold trim, maroon w/gold trim, navy w/gold trim or turquoise w/white trim all with a gold imprint. See "Options" for other than standard imprint colors. Free mailing envelopes are included, not inserted. NO SET-UP CHARGES! 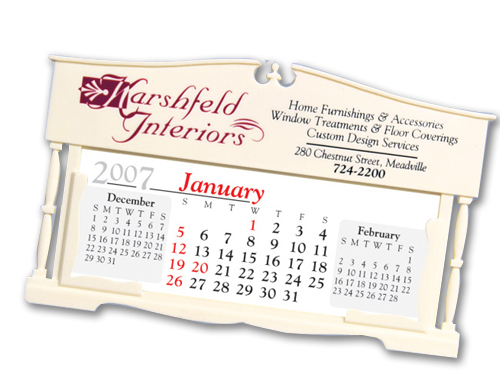 The Hampshire Desk Calendar offers a foil stamped imprint, a 6” x 4 3/16” large memo style 13 month date. Standard in white w/white trim or woodgrain w/gold trim both with a gold imprint. See "Options" for other than standard imprint colors. Free mailing envelopes are included, not inserted.